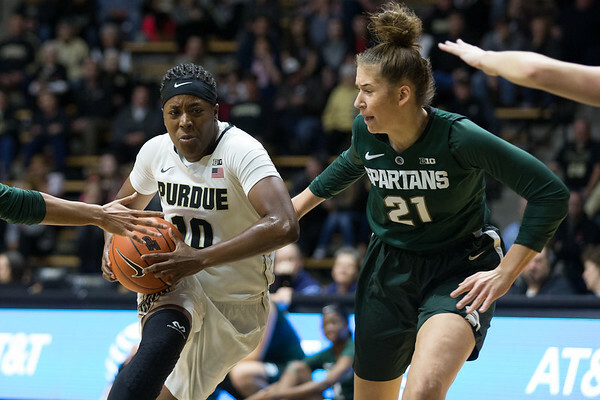 As I said at the end of my Purdue men’s basketball post it is amazing just how few women’s games I attended this season. Life and work just seemed to get in the way this year. I used to make a special effort to get to games, but even when I was home this year it seemed like I was just coming home from a trip. Family was the key word this year. That is too bad as I missed a team that really found itself over the course of the season. This was also the senior class that I started photographing from the sidelines. I remember covering the Big Ten Cross Country Championships here in West Lafayette when one of the photographers had to break away to shoot the exhibition game. One of the young girls had a great game. Her name was Bridget Perry, and she would have a nice career here. At the time I was jealous because the other guy was able to shoot in Mackey. I could only dream of that. By the end of that season I would shoot both of the Boilers NCAA games at home in Mackey. That was a special year for me. This season was full of bad breaks for me with the team. I was out of town for senior day. I was not happy about that, but I was making money, and that is what this is all about. I also tried to get credentialed for the Big Ten tournament as well as the NCAA games in South Bend, but it did not work out. That is too bad as the Boilers played their hearts out at both venues. This team lost a lot with Morrissette and Perry leaving, but they have a young group of players on the team that really came on strong as the season went on. Imagine that squad a year older. As I really did not get to many games I thought that it would do nothing to stretch this list out to 17. I kept it at ten to highlight some key points. Next years goal is to get to more games so that I can do a proper gallery for the team at the end of the year. Here are the images that I liked from the 2016-2017 season. 10. By the time I get to see the teams I have already seen many photos from practices and what makes in onto the poster. 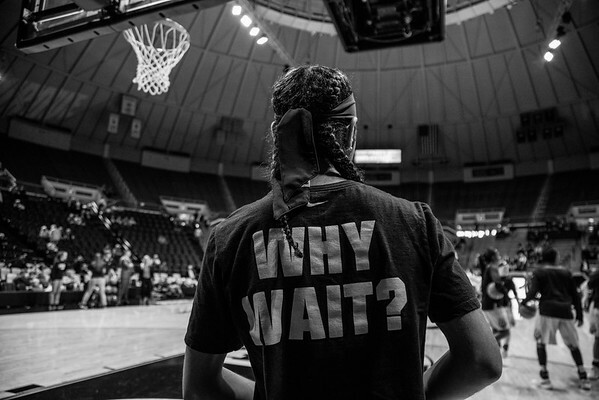 This season the motto was “Why Wait” I liked seeing that on a shirt at my first game of the year. When I made this I knew that it would be black and white, and that it would be a great way to lead of this countdown. 9. 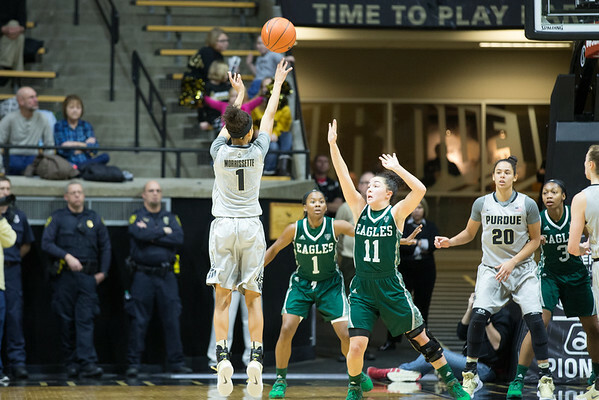 I love the new introductions for both the men’s and women’s team at Purdue, but usually it is so crowded that I let the people getting paid make the photos. Here I was lucky enough that nobody else was shooting this so I decided to give it a go. It is a fun way to get some different shots in before the game even starts. At the time that I made this Dominique Oden had yet to really assert herself. She would by the time the season ended. She is one of the players that will be fun to watch next year. 8. 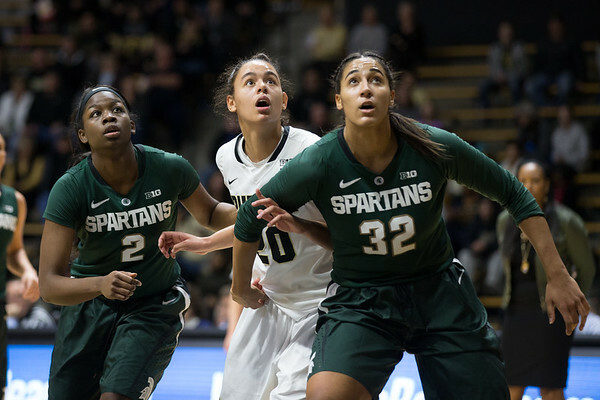 Andreona Keys plays a hard nosed type of basketball. I love her drives as they remind me more of a running back going through the hole than a player going to the hole. Here you can see a little bit of that. Keys is a player that I love to photograph as she gives you a lot to work with. She has a big role to play next year as a senior. 7. Speaking of big roles to play these two players have just that next year. 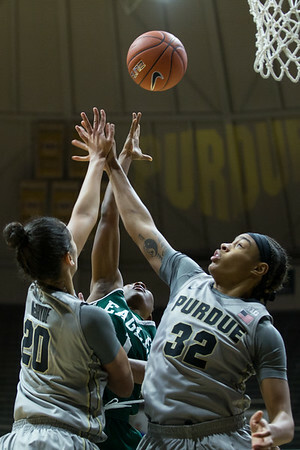 I was not shooting this game for Purdue, but I thought that the moment was a good one. 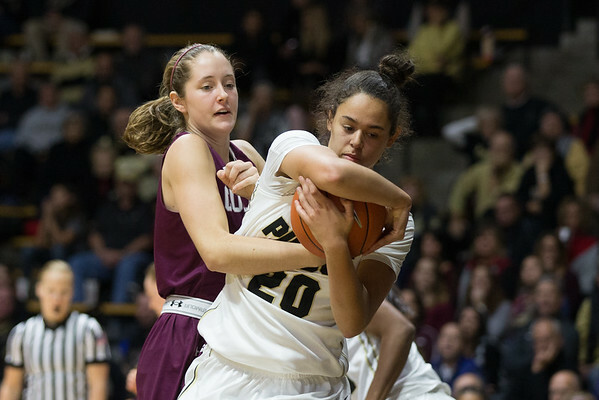 Two young players battling for the ball with Purdue written in the background. I think that these two will add another banner to those behind them as well before they leave. 6. I probably shoot this scene too much, but I like it way too much to not do it. The moment of anticipation on the faces as the free throw hits the rim is just too much fun not to shoot. Looking back on my photos it is one of those shots that I do a lot during a game, but it creates some tension in the photos which I like. 5. If I had to pick one photo of mind to celebrate the career of Bridget Perry it would be this one. She played the game hard, and was fun to watch. Early on in her career (as well as mine) I loved photographing her because of her hair. It was always be going the opposite way that she was. It was shorter during her senior year, but her determination was just as intense. 4. 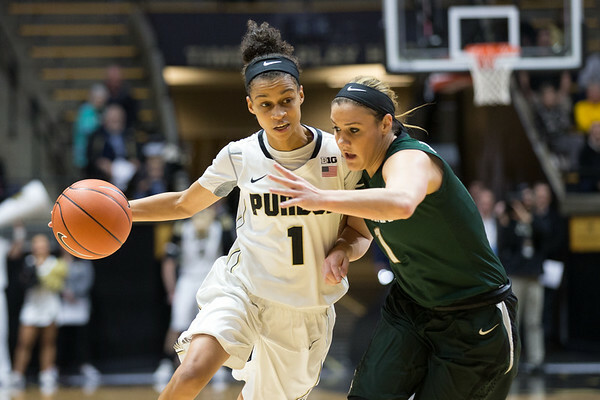 Three of the top four photos in this countdown are of senior Ashley Morrissette. 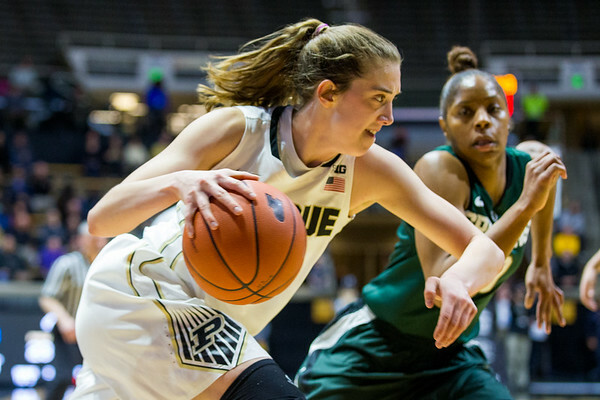 I think that she really grew during her time at Purdue. Early on she had some great leaders on the team to take control when it was needed. At some point during her junior year though she seemed to take control. From that point on the team was hers. 3. This was another shot made during a game when I was shooting for the other team. When something happens I don’t stop shooting though just because it is not my team. It was a tough moment for Dominque McBryde, and I am glad that I decided to push the shutter button here. 2. This was another photo that I made while shooting for the opponent. I knew that Ashley was close to 1,000 career points as I read the game notes before the game. 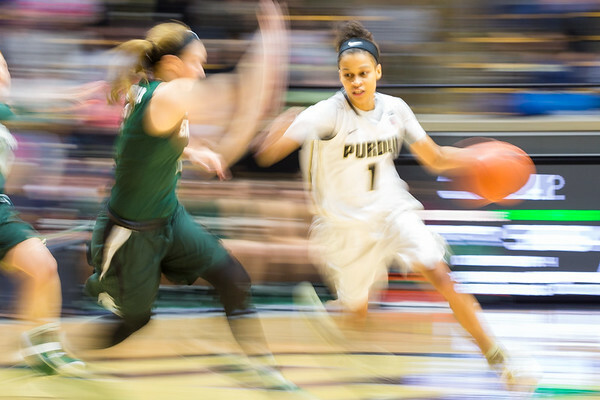 As the second half started I saw that the Purdue photographer did not make it back onto the court yet. I was not going to leave my spot because I had a job to do, but when Ashely went up for the shot I made this from my spot at the other end of the court. Looking back I wish that I had been a little wider at the time. It was a great moment for her. She would add to that total as the season went on. This is number one on the countdown for a couple of reasons. The first is that I think that it represents just how quickly time flies covering college athletics. It really does not seem like that long ago when Ashley was a freshman and I was just starting down this road I am on. Things have moved along quickly though, and she will graduate soon. The other reason I love this photo is how long it took to get. This was shot during my first sporting event of 2017. During the second half I was just going to get a panning shot, and then head home to have dinner with my family. I was not getting anything that I liked from my spot though. I kept at it hoping that a player would move just the right way for what I had in mind to work. Thankfully that happened and I could leave with a photo that I really liked. 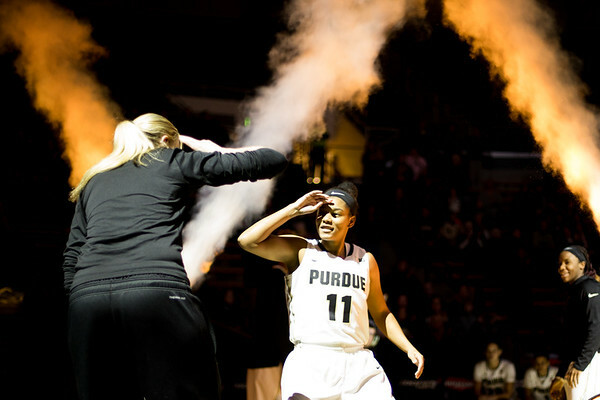 So that is the top ten photos from this past Purdue basketball season. As I have said a couple of times in this post this class meant a lot to me as they were the first ones that I started photographing court side. It was fun to watch them grow. They were part of many of my first successes. My first paid photography job was covering them in an NCAA Tournament game. That is something that I will never forget. My basketball posts will continue with a look back at my favorite Indiana State basketball pictures next week. I will also have my normal photo of the day post up later on today.